Red is quite handsome! You are fortunate to have a Seneca ‘dale. We currently have River, age 7. We have had 3 Seneca Airedales and all were quite wonderful. Great with kids, funny, smart and loving. 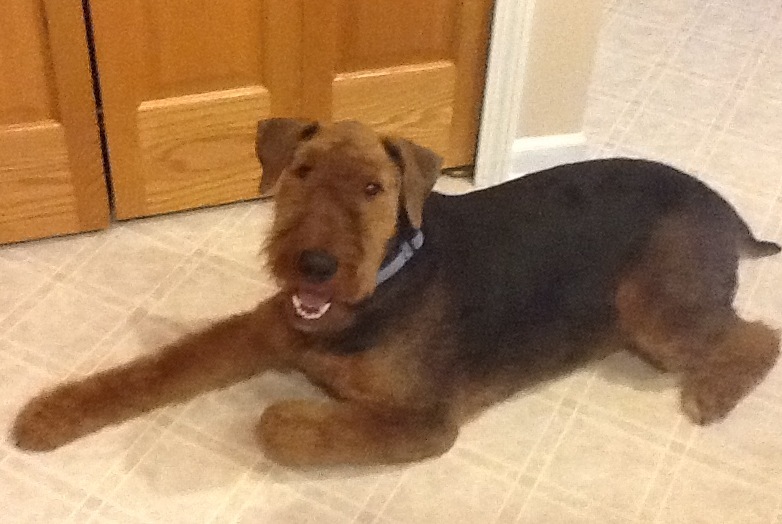 Got our first Airedale in 1965. We love the breed………nothing else compares! We have one of the Nov 2011 puppies. “purple” I think. – Now Cleo. She’s beautiful. She weighs 63 pounds and is quite tall. She’s a great dog. She even won a prize at dog training class. Okay, I have to admit that she separates “working” from “real life”. At home, we still have to convince her that she is NOT in charge. She loves the water. She swims like a fish and will jump into anything bigger than a puddle. She gets a puppy clip from the groomer and we need it because she collects every burr in the woods. I will have to search for a good picture and send it later. We have a Nov 2011 puppy too…..Light Blue……Now SCOUT. She is a wonderful dog. She is full of play and also loves the water….She can do lots of tricks and is a wonderful walking companion. She plays dead if you pretend shoot her…….she is the center of attention at our house……. :) We just love her….. I would upload a pic but I’m not sure how to do that on here…..
Hi! It’s great to hear how little Light Blue is now a SCOUT! If you send me the photo on my email, I can upload it for you. I’m sure everyone would like to see….